Or unwilling ? Arguing and blaming everyone/thing else is simply more fun. Now if you could only learn to debate in proper english we could all submit to your awesomeness. Remember that he claims to be dyslectic. So what he writes may not be the same as what he thinks he writes. He probably meant to write "I'm a Grandmaster in bullshitting"
yeah, that is certainly one definition of a forum troll. Hence the request to have you banned. Forums exist to share share technology information. Everyone would be happy if you took your word fighting skills to a different venue. 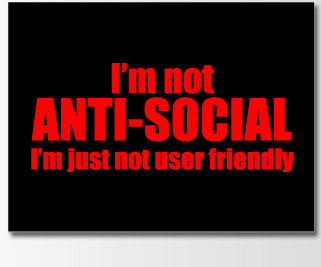 I do recognize how antisocial your behavior is to me. In my world the skill of word fighting is not the same than doing word fighting for trolling. but maybe you can not make a difference between imaginary and reality ? please call a psychiatrist to fix this problem. First it was ASD, then it was Aspergers, now it's dyslexia. At worst, it's all a lie. At best, he'll be cured in a few more pages, since his ailment seems to be getting progressively better as this thread progresses. Cheese insisted that I be banned for profanity, and hereby claim that I suffer from "Faux Internet Tourette Syndrome". Like Qar, I was diagnosed when I was 12 by someone who wasn't a doctor. Wait...you just issued a challenge to everyone to engage in a contest of wits. Then you turn around and say that you aren't really playing that game, that it is just imaginary? Again, there is no need for imaginary or real game playing on a technology forum. Join MENSA, or do crossword puzzles, or play chess, or online gaming. There are thousands of appropriate outlets for you to explore or enhance your "word fighting" skills. now you disappoint me because your sentence can not be the logical conclusion because the word: "Maybe" makes it a Dialetheism therm and this is per definition: wikipedia: "Dialetheism is not a system of formal logic"
the other people play this "game"
Please try again if you can. in Germany I'm sorted out as stupid.